The chairperson Mr. Kumano donated 301 historic Buddha statues he protected in Myanmar to Most. Ven. Pandawontha of Aung Zabu Tawya Temple on October 18th, 2012. Since then,the locals of Myanmar call Aung Zabu Tawya Temple is called as Japan Pagoda named after Japan with the gratitude to Japanese people. In spring 2005, the chairperson Mr. Kumano wandered into an old decayed temple by chance in Bagan, the antient city of Myanmar. As soon as he encountered with a demonic dreadful black figure in there, he ran back to Japan in the blink of an eye. The figure appeared in his dream every night even in Japan, so he made up his mind to fly back to Myanmar and restore the antient temple. In 2006 a year after the restoration, Mr. Kumano heard a rumor that many historic Buddha statues would be taken away illegally from Myanmar to different countries as China and Thailand. If this “outflow” was left alone, Mr. Kumano thought cultural heritages of Myanmar would never come back to the hands of Myanmar people. With this fear, he purchased the Buddha statues at his own expense and decided to protect them. The number of statues counted up to 301 in total. Donation of 301 Buddha statues to Most. Ven. Pandawontha of Aung Zabu Tawya Temple. The chairperson Mr. Kumano wished to donate 301 Buddha statues to temples in Myanmar, but he could not find a person he liked to do so. On October 10th, 2012 when he first met with Most. Ven. Pandawontha introduced by Mr. Soe Lwin, a friend of Mr. Kumano, he without hesitation decided to donate all 301 statues to him because he felt they were real brothers in a past life. It was ten years ago in 2006 when the chairperson Mr. Kumano started the protection of Buddha statues. It was also 10 years ago that Most. Ven. Pandawontha leaded by an oracle of the Buddha visited Mobi Township, Yangon from a temple in Mon State to start the construction of a temple. About a month ago when Mr. Kumano’s donation of 301 Buddha statues was done, the construction of a 2-floor very large auditorium was completed. At that time, no one knew why a large temple was built. Now, 301 Buddha statues are enshrined crowdedly in the temple that was once hollow. It is said that Myanmar Japan Pagoda became very well-known in Myanmar that there are no present Myanmar people who does not know the pagoda. When it comes to Sunday, more than 50 thousand people visit the temple for prayer. 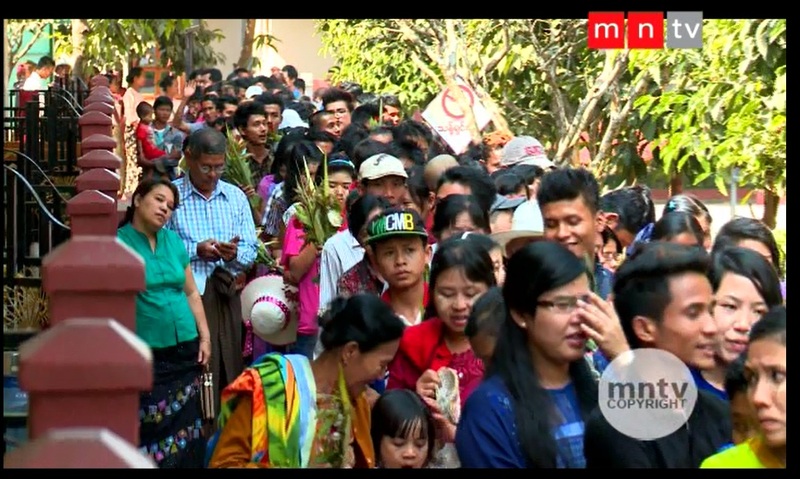 Myanmar National TV broadcasts the visit of Buddhists to Aung Zabu Tawya Temple (Myanmar Japan Pagoda) in Myanmar. It is a sacred place where tens of thousands of Buddhists visit on Sunday. 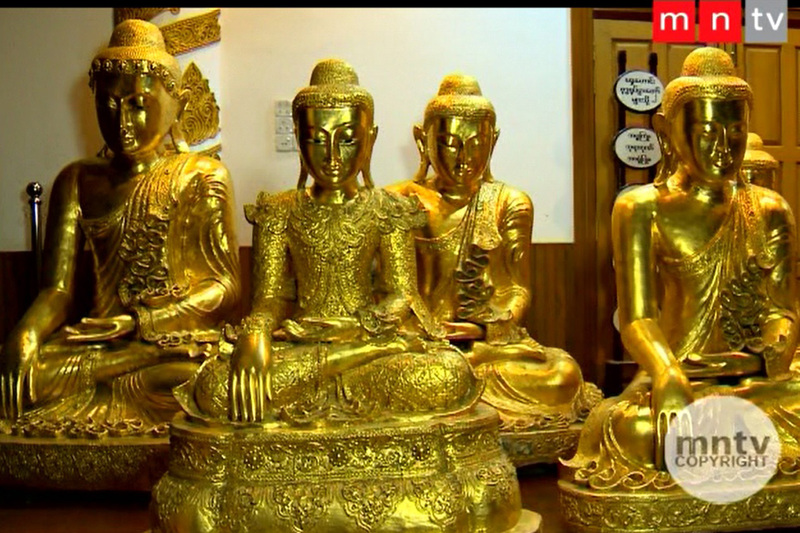 The TV also screened a pious Buddhist praying Statues enshrined in Myanmar Japan Pagoda. Check the movie “Support Activities” for the details on Director Katusyuki Kumano’s donation of 301 Buddha Statues (MNTV televised). Many ancient Buddha Statues in various forms (donated by director Kumano).